This is the first game in the Tenchu series. For other games in the series see the Tenchu category. 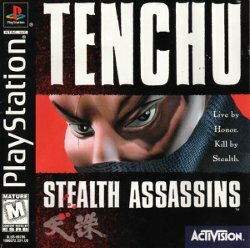 Tenchu: Stealth Assassins is a stealth action adventure game released in 1998 for the PlayStation Game Console. Players take the role of either of the two playable ninjas, Rikimaru or Ayame. There are 10 Missions in which they must use stealth and ninja items to complete objectives. This page was last edited on 23 October 2009, at 22:20.